A aerial rendering of the completed parking structure. 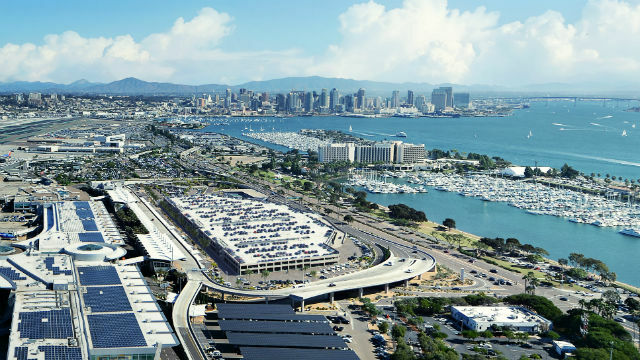 Construction began Wednesday on a three-story, 3,000-space parking structure at Terminal 2 of the San Diego International Airport that will open within two years. The new structure will feature state-of-the-art parking technology that will allow motorists to reserve spaces in advance, find available parking spaces, and streamline payment. Some 1,800 spaces will be gained, and many of those will be covered. Construction will take approximately 20 months and the structure will be open for summer travel in 2018. During the construction period, parking for Terminal 2 is available west of the terminal off McCain Road. Valet parking is also available at a reduced rate.